updates updates updates! — Carly Romeo & Co.
Hey y'all! It's been a while since I posted a real update on here so here we go! 2014 is off to a rollicking start. In January, I met my goal of booking twelve weddings for the year--three of which were booked in one wonderful day! This past week, I went to contract on two more for a total of FOURTEEN weddings! Not bad, huh? AND I still get to take June off for conferences via my day job. 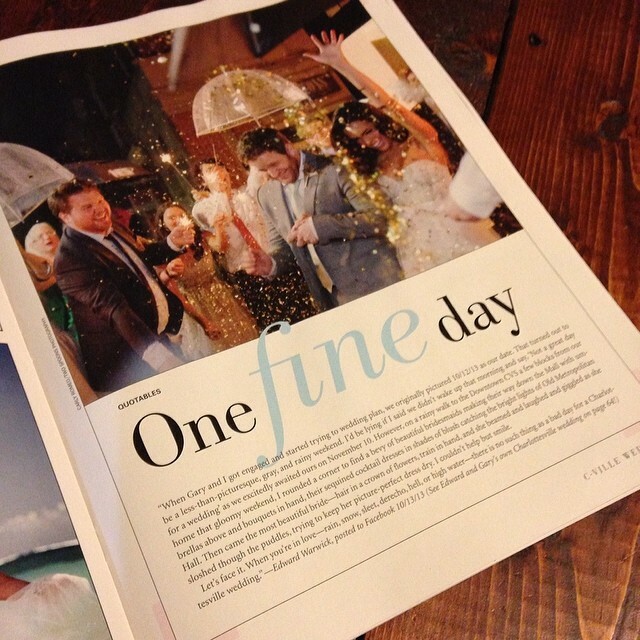 A shot from a wedding I did in Charlottesville last October was published in CVILLE Weddings--woo! It's my first print publishing and I'm pretty freaking excited about it. That wedding was so super fun to shoot (with help from my friend Scott of Scott P Yates Photography), despite the rain, and that shot was actually voted my best of 2013! So, fitting. Another amazing wedding from last summer was then featured on Marry & Bright, a Virginia wedding blog. This wedding was special not only because there were two gorgeous brides (kickass), but because it was the first wedding I did for a couple who found me on the internet (not via friends, etc)! I've also started using Pinterest (gulp) and will be soon posting more lists, advice, and maybe even a photoshop tutorial or two! So get ready for Two Spoons University. Another exciting development is that I'm hiring an intern to help out with the super super busy upcoming season! I've already gotten a lot of strong applicants but if you know somebody who would be great, please send them my way! Finally, I'm doing a rebranding/update of my website and could use your input about my new logo. Here are the four top contenders (at the moment). Let me know your favorite in the comments!